The income level necessary for families to secure an adequate but modest living standard is an important economic yardstick. While poverty thresholds, generally set at the national level, help to evaluate what it takes for families to live free of serious economic deprivation, the Economic Policy Institute’s (EPI) Family Budget Calculator—recently updated for 2013—offers a broader measure of economic welfare and provides an additional metric for academics and policy experts looking for comprehensive measures of economic security. The basic family budgets presented in this report, as well as those presented via the Family Budget Calculator itself, measure the income families need in order to attain a secure yet modest living standard where they live by estimating community-specific costs of housing, food, child care, transportation, health care, other necessities, and taxes. EPI’s Family Budget Calculator is particularly useful given the inadequacies of both the federal poverty line and the new Supplemental Poverty Measure (SPM) when it comes to measuring families’ fundamental needs (CCED 2013). EPI’s basic family budgets overcome many of these shortcomings by providing a wealth of geographic and family-type detail; they are calculated for over 600 U.S. communities and six family types (either one or two parents with one, two, or three children). The rich detail afforded by these geographic and family-type customizations, the relative accessibility of these numbers, and the rigor and transparency with which they are developed make the family budgets presented in this report and via the Family Budget Calculator uniquely valuable to non-experts and academics alike. This issue brief begins by explaining in greater detail the advantages of EPI’s basic family budgets as compared with the federal poverty line and the Supplemental Poverty Measure. It then illustrates the budgets’ most important feature—their high degree of customizability by family type and community—by demonstrating how family budgets vary significantly depending on family size and geographical area. The basic family budget for a two-parent, two-child family ranges from $48,166 (Marshall County, Miss.) to $94,676 (New York City). In the median family budget area, Topeka, Kan., a two-parent, two-child family needs $63,364 to secure an adequate but modest living standard. This is well above the 2012 poverty threshold of $23,283 for this family type. For a two-parent, two-child household, housing ranges from 10.7 percent to 26.1 percent of a family’s budget. Housing for this family type is most expensive in Nantucket, Mass.,($1,877 per month), and is least expensive in both Macon and Smith counties, Tenn. ($570 per month). Across regions and family types, child care costs account for the greatest variability in family budgets. Monthly child care costs for a two-parent, one-child household range from $334 in rural Mississippi to $1,318 in Washington, D.C. However, in the latter, monthly child care costs for a two-parent, three-child household are $2,114—60 percent higher than for a two-parent, one-child household. Even in the best of economic times, many parents in low-wage jobs will not earn enough through work to meet basic family needs. Annual wages for one full-time, full-year minimum-wage worker total $15,080, far below what is necessary for a one-parent, one-child family to live in even the least expensive family budget area. The EPI Family Budget Calculator overcomes many of the shortcomings of the federal poverty line and the Supplemental Poverty Measure by illustrating the income required to afford an adequate standard of living for six family types living in 615 specific U.S. communities. As will be explained in greater detail shortly, that the budgets differ by location is important, since certain costs, such as housing, vary significantly depending on where one resides. Geographical cost-of-living differences are built into the budget calculations by incorporating regional, state, or local variations in prices (depending on item). This geographic dimension of EPI’s family budget measurements offers a comparative advantage over using poverty thresholds, which only use a national baseline in their measurements (e.g., the federal poverty line), or which use a geographic component only for measuring home prices (e.g., the SPM). Basic family budget measurements are also adjustable by family type because, as illustrated in the following section, expenses vary considerably depending on the number of children in a family and whether a family is headed by a single parent or two parents. The six family types include one or two parents with one, two, or three children. The following is a brief description of each component of EPI’s basic family budgets and the restrictions and/or working assumptions employed. For a comprehensive discussion of our methods and data sources, see Economic Policy Institute 2013 Family Budget Calculator: Technical Documentation (Gould et al. 2013b). Housing. Housing costs are based on the Department of Housing and Urban Development’s (HUD) fair market rents, or FMRs (HUD 2013). FMRs represent rents (shelter rent plus utilities) at the 40th percentile (i.e., the dollar amount below which 40 percent of standard quality rental units are rented) for privately owned, structurally safe, and sanitary rental housing of a modest nature with suitable amenities. Rents for two-bedroom apartments were used for families with one or two children, and rents for three-bedroom apartments were used for families with three children (based on HUD guidelines). Food. Food costs are based on the “low-cost plan” taken from the Department of Agriculture report Official USDA Food Plans: Cost of Food at Home at Four Levels (USDA 2013). This plan is the second-least-expensive of four types of food plans and assumes almost all food is bought at the grocer and then prepared at home. The USDA food plans represent the amount families need to spend to achieve nutritionally adequate diets. Transportation. Transportation expenses are based on the costs of owning and operating a car for work and other necessary trips. The National Household Travel Survey (FHA 2009) is used to derive costs based on average miles driven per month by size of the metropolitan statistical area or rural area and multiplied by the cost per mile, as provided by the Internal Revenue Service (IRS 2012). Child care. Child care expenses are based on costs of center-based child care for four-year-olds and school-age children, in urban and rural areas, as reported by the Child Care Aware of America annual report on the cost of child care by state (CCAA 2012). Health care. Health care expenses have two components: insurance premiums and out-of-pocket expenditures. Premiums are based on total employer-sponsored health insurance premiums (for both employee-plus-one and family plans) for private-sector employers by geographic area, using the Medical Expenditure Panel Survey Insurance Component (HHS 2013b) and the Bureau of Labor Statistics Employee Benefits Survey (BLS 2013b). Out-of-pocket medical expenditures are calculated for adults and children separately by region and are differentiated between metropolitan statistical areas and non–metropolitan statistical areas for those with employer-sponsored health insurance (HHS 2013a). Other necessities. EPI’s basic family budgets include the costs of other necessities such as clothing, personal care expenses, household supplies, reading materials, school supplies, and other miscellaneous items of necessity from the Bureau of Labor Statistics Consumer Expenditure Survey (BLS 2013a). Taxes. The family budget components enumerated thus far sum to the family’s post-tax income. To calculate the tax component of family budgets, we utilize the National Bureau of Economic Research’s Internet TAXSIM (NBER 2013) to gather information on federal personal income taxes, state income taxes, and federal Social Security and Medicare payroll taxes. Budgets rise significantly with family size, since more children require more housing, health care, and child care. Monthly child care costs for a two-parent, one-child household can be as low as $334 in rural Mississippi and as high as $1,318 in Washington, D.C. However, in the latter, monthly child care costs for a two-parent, three-child household are $2,114—60 percent higher than for a two-parent, one-child household. 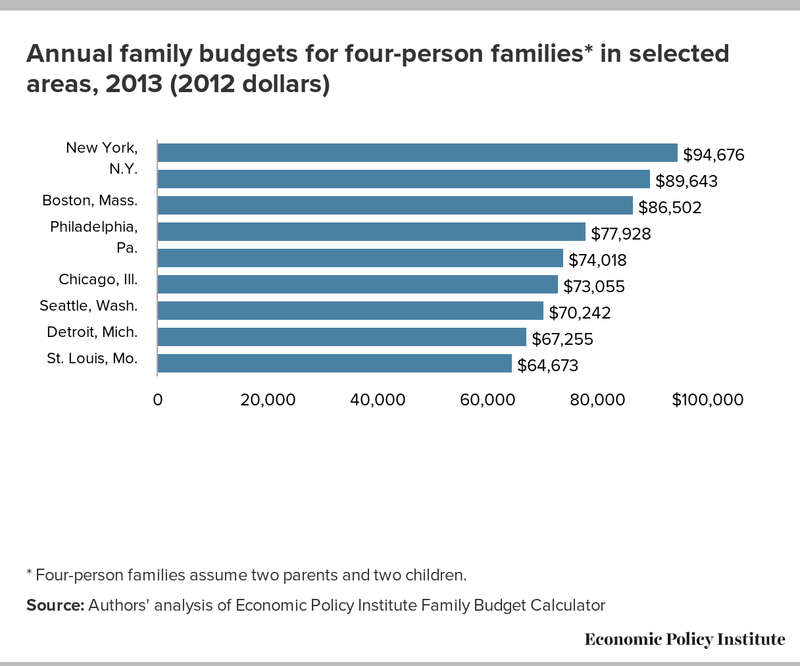 For illustrative purposes, the monthly family budgets for six different family types in St. Louis, Mo., are depicted in Figure A. They range from $3,949 for a one-parent, one-child family to $6,557 for a two-parent, three-child family. Some items, such as transportation, do not change substantially with the number of children in a family, but an expense such as child care does. 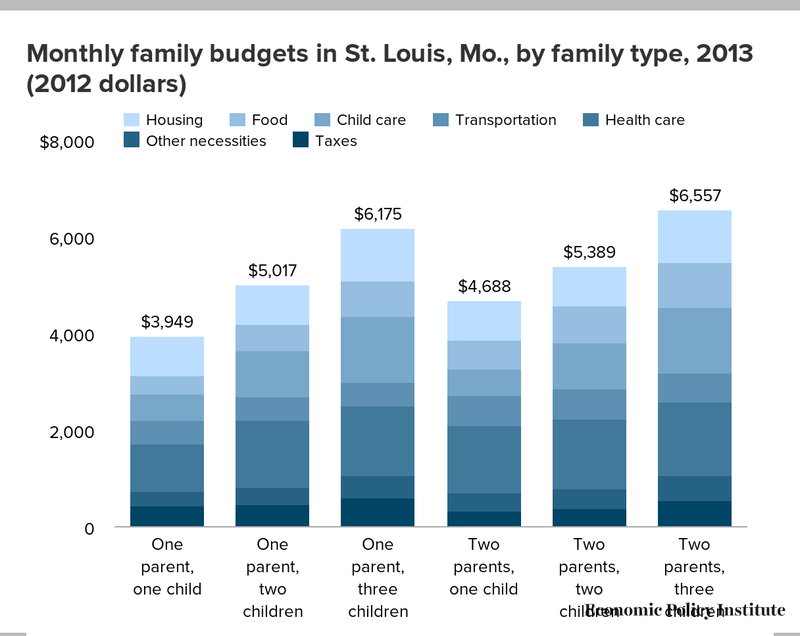 In St. Louis, child care consumes roughly one-eighth (11.7 percent) of the budget for a two-parent, one-child family—but for a two-parent, three-child family, it accounts for more than a fifth (20.9 percent). In addition to varying by family type, many costs vary widely by geographic area. However, as mentioned previously, neither the federal poverty line nor the Supplemental Poverty Measure accounts for these geographic differences to the extent that EPI’s Family Budget Calculator does. Figure B, which compares the annual budget for a family of four (composed of two parents and two children) in selected large urban areas, depicts the importance of accounting for geographic differences in the cost of living. The annual budget for a two-parent, two-child New York City family is $94,676—40.8 percent higher than that of a similar Detroit family ($67,255). New York City’s surrounding areas (Nassau, Suffolk, and Westchester counties, which are not shown in Figure B), Washington, D.C., and Boston follow closely behind New York City in terms of their high cost of living. Among the major cities included in Figure B, EPI’s family budgets range from 2.5 to 3.1 times higher than the Supplemental Poverty Measure thresholds for those areas (CPS ASEC 2012). * Four-person families assume two parents and two children. This overall geographical variation is driven largely by variability among the housing, health care, and child care components. For example, for a two-parent, two-child household, housing ranges from 10.7 percent to 26.1 percent of a family’s budget. Housing for this family type is most expensive in Nantucket, Mass. ($1,877 per month), and is least expensive in both Macon and Smith counties, Tenn. ($570 per month). However, across regions (as well as across family types, as alluded to previously), child care costs account for the greatest variability in family budgets. Among two-parent, two-child households, child care is most expensive in places such as New York City ($2,006 per month) and least expensive in places such as Marshall County, Miss. ($501 per month). 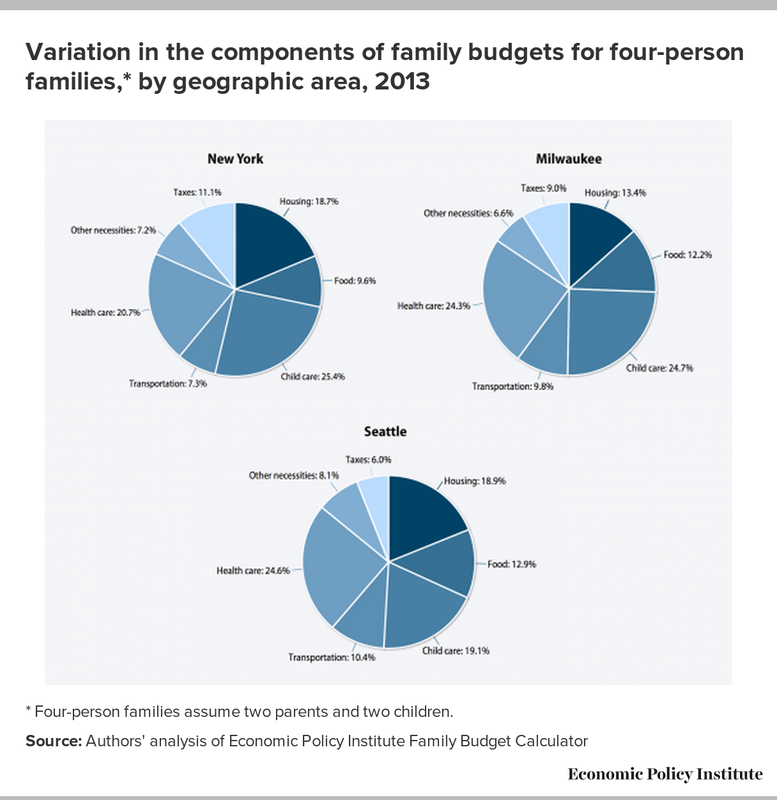 Figure C illustrates this overall geographic variability by holding family size constant and comparing the share of family budgets accounted for by each of the seven components in three different areas—New York City, Milwaukee, and Seattle—for two-parent, two-child families. In New York City, where monthly rent for a two-bedroom apartment is $1,474, families can expect almost a fifth (18.7 percent) of their budgets will be spent on housing. This contrasts with only 13.4 percent for Milwaukee residents. While families in both New York City and Milwaukee devote at least a quarter of their monthly budgets to child care, the share stands at less than a fifth (19.1 percent) in Seattle. Health care costs also vary considerably across geographic areas. Families in Milwaukee and Seattle spend nearly a quarter of their budgets on health care, while New Yorkers allocate 20.7 percent. 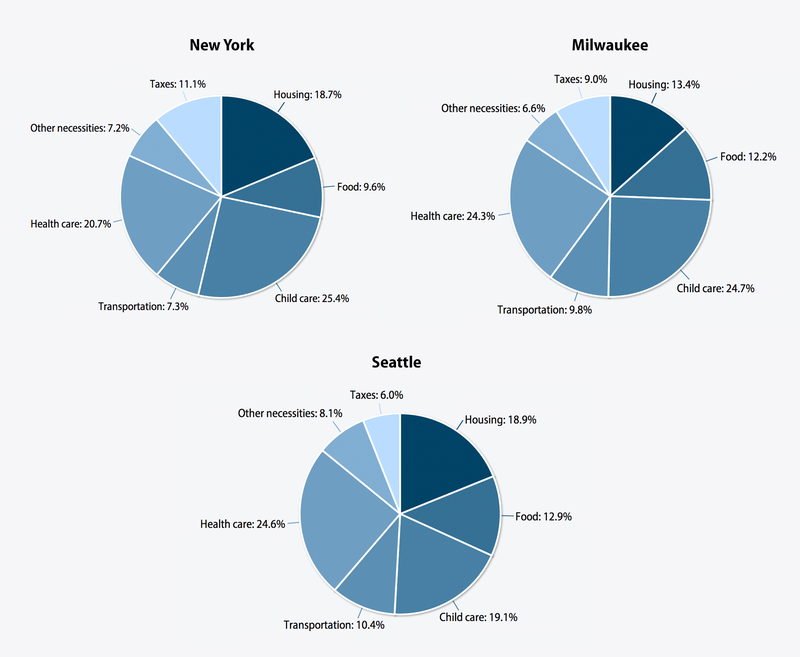 New Yorkers spend a larger share of their budgets on taxes than residents of Milwaukee and Seattle, but much less on transportation. It is clear that even in the best of economic times, many parents in low-wage jobs will not earn enough through work to meet basic family needs. A full-time, full-year worker paid $7.25 per hour (the minimum wage) will earn about $15,080 a year before taxes (DOL 2009). This is below the federal poverty line of $15,825 for a single parent with one child—and far below the income necessary for such a family to attain a secure living standard even in the least expensive family budget area (which stands at $35,089 for that family type in Simpson County, Miss.). The authors acknowledge the Ford Foundation and the Public Welfare Foundation for their generous support. They also express gratitude to Jared Bernstein and Sylvia Allegretto for laying the groundwork for this research. Additionally, the authors thank Josh Bivens for his consultancy as EPI’s research and policy director and his help on the tax model; David Cooper, EPI economic policy analyst, for his expertise with the Supplemental Poverty Measure; and Michael McCarthy, EPI editor, for greatly improving the prose. Federal Highway Administration (FHA). 2009. National Household Travel Survey (NHTS). Tabulation created on the NHTS website, http://nhts.ornl.gov.